NES College wanted to drive footfall at their Fraserburgh and Aberdeen open days in October and November 2015. With social media advertising their chosen MO, they turned to Fifth Ring. Specific demographics meant specific messaging, so we ran a variety of tailored ads to appeal to students and their influencers (let’s call them parents to give them their official demographic title). Of course, different audiences react to different messages. So ad headlines and imagery were tailored individually to appeal to specific audiences, ensuring our messaging was as effective as possible. And throughout the campaign, we continually and closely monitored the ads, measuring how they were performing, so we could turn off the poorer performing ads and maximise the efficiency of the top performing ads. This meant we could optimise the campaign spend, focusing solely on the ads which generated the lowest cost-per-click for the client. Oh, and we learned that the simplest and clearest ad headlines performed best. Something any self-respecting copywriter will tell you. Our media schedule featured a series of MPU ads firmly targeted on news and lifestyle websites in Scotland on the Google Content Network. These ads were heavily weighted towards the students’ parents and part time students. Our Facebook ads delivered over 595,000 targeted ad impressions, achieving impressive cost per click rates of just £0.19. The Google Content Network campaign also delivered a huge number of targeted ad impressions (over 1.3million) with 798 registrations for the open day. Some ‘experts’ out there call this programmatic advertising. We call it common sense. Highly effective, buzzword-free, common sense. 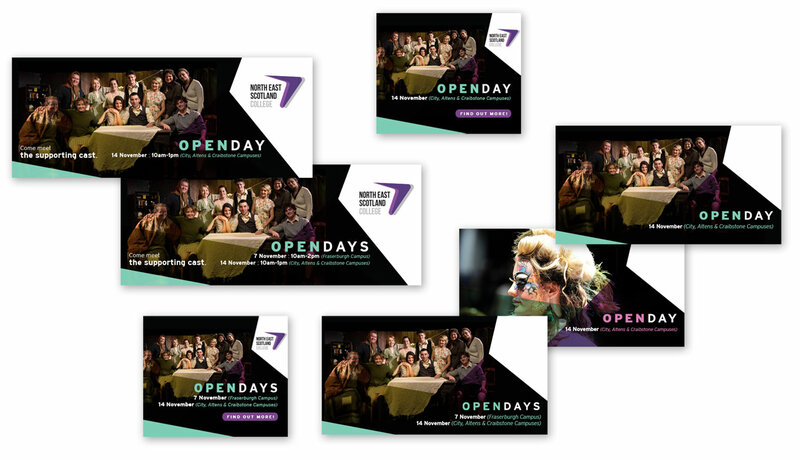 Following our campaign, the open days were hugely successful, with Aberdeen in particular experiencing one of their busiest open days on record.